The Little Hose Monster™ is used for fire pump testing, rooftop standpipe testing, hydrant flow testing and flushing. Small and lightweight – yet it neutralizes the tremendous force of discharge water. The Little Hose Monster has no pitot so small rocks and debris pass right through the system without causing damage. The Little Hose Monster requires a Pitotless Nozzle or Flushing Nozzle (sold separately). Pitotless– The Little Hose Monster is designed to work with the Pitotless Nozzle™. (sold separately) Just push the Pitotless Nozzle into the inlet of the Little Hose Monster. The spring loaded latch levers automatically snap into place. There is no pitot in the system so small rocks and debris pass right through without causing damage to the Pitotless Nozzle or the Little Hose Monster. The Pitotless Nozzles are FM approved for accuracy. 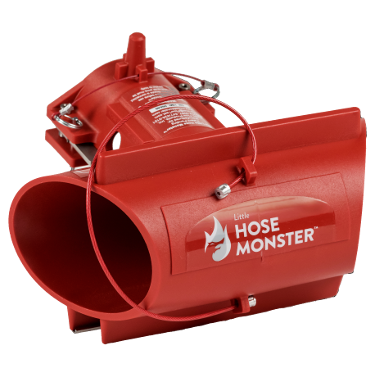 Small – The Little Hose Monster measures 12” wide x 10” and does the job of neutralizing the tremendous force of discharge water as well as the original Hose Monster. Lightweight – The Little Hose Monster weighs only 3 pounds. With the Pitotless Nozzle and gauge, it still only weighs 6 pounds. Durable – The Little Hose Monster is made from injection-molded glass filled polypropylene. Stackable – Made to stack up to three high with the Stabilizer Kit and tie-down strap. Easy to transport – Easily transport a complete pump test setup to the job. They are light enough and small enough to ship FedEx. In the right size suitcase, they can be checked baggage on the airlines. Two Year Warranty – If the Little Hose Monster breaks during normal operation, we’ll repair or replace it at no charge. The Little Hose Monster requires either a Pitotless Nozzle or a Flushing Nozzle (sold separately). Uses: for fire pump testing, fire flow testing of hydrants, rooftop standpipe testing, and main flushing. Material: injection-molded glass filled polypropylene.